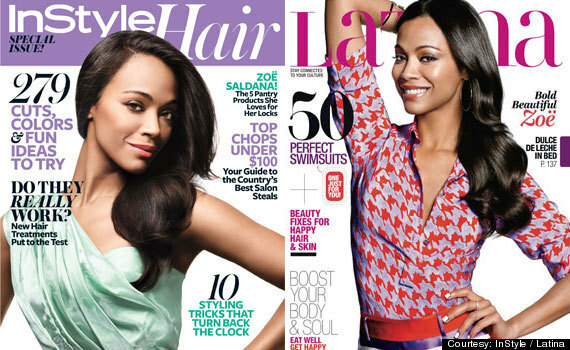 *Zoe Saldana is hot, hot, hot! The ebony hued Latina actress who recently married a man of Italian extraction, shared her inner most thoughts about race, culture, and ethnic differences including skin color and hair. Giving credit where credit is due, the actress gave props to her mother who instilled a sense of pride, shaping her identity. “My mom raised my sisters and I with a strong sense of self. [My mother] always said, ‘Honey, there is nothing that a red lipstick and a pair of red shoes can’t heal, cure, or solve.’ And I absolutely believe that. They can get you out of anything, even the biggest funk of your life,” she said to the fashion and style magazine. Her discussion on the topic continued with Latina magazine, where she touched a bit more on her childhood and her outlook on love and men. Same ole washed up statement. ..and yet, since being famous, she has not dated a black man. go figure! I say the same thing about her also…..She has never dated a black or latino man ever….something about her is fake. So what if she hasn’t dated a black man?? What about those famous black men who only date white/hispanic women? I agree that Zoe is full of sh** but let’s cut out the double standard. A person can’t help who they fall in love with sometimes….But whenever a person of color becomes famous and successful don’t make it seem like men or women of color aren’t good enough for you, that sends a negative message to the community. I just find it so strange that all these beautiful Black and Latin Men in the world and she can’t even find one? As a Black woman, I feel no connection to her whatsoever. But I wish her luck in her new marriage. Why do you have to prove your heritage by whom you date? If that were the standard, then there are no black men in the NBA. It’s a fkn JOKE how this chick “cherry picks”, when she wants to be seen as a….woman of “color”, while EVERY move she makes otherwise?, reflects ….”she ain’t reeeeeeally feelin” the skin she’s in”! FOH! @NYCsoul…Hey lady! :-)! Hey….to me?, the difference is?…..those brothas that get wit them Beckys?, don’t hold “interviews” claimjng to “luuuuuuuuv dey sistas” n ish, “they”?, just…do the Beckys & SU! But females like this ine & Halle,Diana, Diane,Alfree etc…?, are hypocritical, in their statements AND actions! So….the double standards are waaaaaay higher, ‘on the female’s sides! I think it’s one thing to be or do Fd up ish, but a faaaaaaar different thang to always be “running for a soapbox/podium” to be a fkn…..hypocrite. In a phrase?……”silence is golden”, when doing dirt. Bling! Yourrrrrrrr thoughts, madam?? :-))! Priscilla, my sentiments exactly…I feel no connection to her and believe she’s the type to use Blacks as stepping stones like so many latinas. Also, latinos are all about lightening up their demographic so her mother must be thoroughly pleased by her choice in men. I’m not sure what this woman has done to deserve so much hate. Have to admit, I’ve never really paid much attention to her. I can’t believe it’s only because she has chosen not to limit her options to dating only blacks and latinos, Doesn’t make her any less black or hispanic. Personally, I’ve never understood so many black women’s refusal to date outside the race. Why limit who you love and miss an opportunity for happiness. From what I can see, black men sure aren’t following this unwritten community code. Well, to me its not many famous black couples in the industry that has been married 10-20yrs you probably can count on your hands, and the reason, fear the other person will take half. The love part now is based on money and the (it) person. She Just Needs To Stick To Her Actual Race, We African American People Are Proud Of Our Color And Are Proud Of Our Real Black On Black Love…….Whoever Disagree Can Keep Your Comment to Yourselves Because I Don’t Give No Fucks!!!!!! Not One Bit!!!!!! !